Ah well, today marks a month since the official GSoC coding period started. Brief intro: I’m working on implementing automatic tagging of faces for digiKam, with face detection and recognition. For that, I’ve been working on a library named libface that does the detection and training/recognition. At some point, it was deemed necessary to make a Qt wrapper for libface, so that Qt/KDE programs could easily use it. This has been now (almost) done, and the resulting library is named libkface. libkface will be put somewhere in kdegraphics/libs as soon as the API freeze is over (I think), and will be usable not only by digiKam, but also by other programs like KPhotoAlbum. We’re also going to keep the lib(k)face database in a shared directory, so that all programs that may use it can share the same training data. That way, a user migrating from digiKam to KPhotoAlbum (hypothetical, with face recog) would not have to retrain libkface with his entire collection. I am very excited by the Qt Quick technology and I have finally found a reason to use it and gain some experience with it and want to report from my first hours of exploring it. The first time I have seen Declarative UI was with Enlightenment and the Edje framework. I liked it so much that I registered Epicenter five years ago. The plan was to create a handheld framework using declarative UI. Сегодня, 23-го июня, увидела свет очередная версия интегрированной среды разработки Eclipse — 3.6 под кодовым названием «Helios». Вчера, 22-го июня, состоялся выпуск пакета проприетарных драйверов видеокарт NVIDIA для ОС Linux версии 256.35. Это — первая версия драйверов серии 256, имеющая статус «официальный»; предыдущие версии относились к категории «beta». в инсталляторе отныне используется сжатие bzip2 вместо gzip. В первую очередь, совместимость с MS Office. Пользователей заботит вопрос "насколько ODF подходит для документооборота?". Другой вариант этого вопроса: "Когда кто-то получит от меня документ — увидит ли он его в том же виде, в каком этот документ вижу я?". Поиском ответа команда, видимо, займётся в ближайшее время. Как отметил один из участников: "Система должна иметь возможность сообщать, что она сейчас делает. Потому что у меня возникает ощущение что она повисла, или упала, и непонятно, что мне вообще делать"
Пользователи признаются, что они, как новички или неподготовленные пользователи, ещё на этапе установки Ubuntu сталкиваются с вопросами, на которые они просто не могут дать ответа, потому что не понимают, чего от них хотят. Один из пользователей сказал, что слова "терминал" и "сервер" отбили у него охоту устанавливать Ubuntu. Слова ‘Gwibber’ и ’broadcast’ тоже входят в этот список. Выпущена финальная версия браузера Mozilla Firefox 3.6.4. В Firefox 3.6.4 некоторые плагины, а именно Adobe Flash, Apple Quicktime и Microsoft Silverlight в среде Windows или Linux выполняются в изолированном процессе. Это значит, что Firefox 3.6.4 будет продолжать работать даже при аварийном завершении работы этих плагинов. Если плагин завис или упал, это не повлияет на остальную часть Firefox. Вы сможете перезагрузить эту страницу, чтобы перезапустить плагин и попробовать открыть её снова. В Firefox 3.6.4 также устранены несколько критических уязвимостей в системе безопасности, а также исправлены некоторые проблемы, связанные со стабильностью работы. Two upcoming (in the fall, that is) conferences of note whose calls for papers are still open. FSCONS: the Call for Papers is open until June 30th. FSCONS is a tremendously fun conference because it’s not just software technology, but Free Culture and other things. That means that there is more scope for learning (well, this is important for me) things outside of software. The compressed earth brick machine made a lasting impression on me last year, for instance. NLUUG fall conference: the topic this (half) year is Security in all its aspects. You could talk about security from a systems administration perspective (for KDE, for instance, managing trust in a global distributed project with only occasional face-to-face contacts) or programmatically (for KDE again: what to do with Plasmoids and mitigating whatever security risks they might bring). This CfP is open until July 12th. Been meaning to do this for ages, so i shall start with an introduction. I am David Hubner, I have taken over maintainer of KInfoCenter and have rewritten if for KDE SC 4.5. I also wrote the Device Viewer in KInfoCenter and the new Summary Information page. The new Summary Information Page is what I would like to talk about. Hugo Pereira Da Costa has supplied two great patches to do with UI consistency, the first has been submitted but I would like KDE users opinion on the second. I like to get opinions before making large UI changes, so from the two images below, could you do me ( and KDE ) a favour and comment on which you prefer. Qt on Rails v0.1 released. But is this Ruby-based Qt and KDE app framework doomed? Can Ruby do for Qt and KDE application development what it did with Rails for web development? With the Qt on Rails project we're attempting to achieve this - using the clean domain logic and conventions of Rails combined with the brilliant application framework and widget set of Qt. So our cool booth dudes and dudettes are regularly hard at work at booths on tradeshows, telling people about our great community. first of all, the booth must be clean. Either we 'work' at the booth, or sit/hack somewhere else. We must make sure we know what we're selling. We should have a list of selling points. The promo team is on this, and we'll distribute it to booth attendants once it's done! Обновился замечательный пакетный менеджер не менее замечательного дистрибутива Arch Linux. Его список изменений содержит множество интересных нововведений, которые обязательно заинтересуют любого заядлого арчевода. Новая опция "Architecture", ограничивающая действия pacman только выбранной архитектурой. По-дефолту выставлено в auto (определение на основе вывода 'uname -m'). Переменная $arch в URL зеркал. При синхронизации извлекаются только обновившиеся элементы. Очистка кэша работает со всеми каталогами, а не только с первым. cleanupdelta — новая утилита для удаления неиспользуемых дельт из БД. Можно одновременно обновлять пакеты и ставить новые (например, 'pacman -Syu rekonq'). Установка через -U наконец-то научилась обрабатывать зависимости, конфликты и замещение пакетов. Установка через -U и удаление пакетов всегда запрашивают подтверждение пользователя. Поле "требуется пакетами" в выводе -Sii (показывает не только установленные!). Новое действие -D/--database, изменяющее данные пакета в БД. Пока можно менять только причину установки (установлен явно/как зависимость). -Qo может сам раскрывать пути (как which). Новые ключи --print и --print-format. Первый напечатает цели вместо выполнения указанного действия, второй позволит формат этого самого вывода настроить. bash-completion переписан для оптимизации и уменьшения размера. Автоматическая остановка при ошибках (больше не нужно писать "|| return 1"). Why is server list under File, while identities is under Settings? Why are neither of these configurable through the "Configure Konversation" menu item under Settings? Why are channel settings under the Window menu? I've summarized all the technology use in our, almost complete, solar passive house on a dedicated blog . And there is more on the linked to post. The IFOSSLR — the International Free and Open Source Software Law Review — has published issue #3. The IFOSSLR is the only journal dedicated exclusively to Free Software legal issues. While I was the FTF-Coordinator at the FSFE it was great to see the careful legal thought put into all kinds of issues (from trademarks to license assignment to risk assessment). It’s important to have an understanding of the legal issues around Free Software (both development and deployment) that is business compatible. That’s not to say that the interpretation is adapted to suit the desires of business — no, it means that the understanding is formulated in a way that businesses understand. It’s quite important to state cause and effect or obligations and rights carefully so that businesses understand what to do and how to do it right. After all, most Free Software developers want everyone to play by the rules set out in the license. 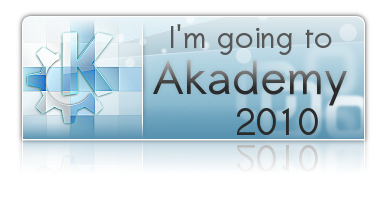 Paul Adams: Akademy: What Will You Go To See? Community is at the heart of KDE. This year it was particularly popular with many talks being submitted. As a result we managed to almost get a day-long track out of it. The track covers community management theory, technologies and legal issues. I’m looking forward to Thomas and Celeste’s talks. I started coordinating the plasma project's activity at this year's Akademy. In support of this, I started a page on our wiki and a thread on our mailing list. For Plasma contributors, there's a topics area on the wiki page where we are building a list of the topics the various people attending want to address while we are there. Last week, Krita development really picked up, and if today's commit rate is anything to go buy, this week will be just as good! We had fifty commits in week 24. Our bug count is now 58, but that's after Sven Langkamp closed half a dozen bugs today. People seem to like Krita 2.2 and do very nice work with it. If you give 2.2 a try and you experience a problem, please inform us about it. There's a very cool and handy Report Bug menu option in the Help menu! "So as you might have heard KDE is going to host its own git infrastructure. This means that the projects currently on gitorious will have to be moved one by one. Zack Rusin (zrusin): No hands! Генерация: 0.339 сек. и 40 запросов к базе данных за 0.188 сек.